Take some time to have fun and indulge in some of these outdoor activities in Nevada. With adventurous activities and some that are more relaxing, there is something for everyone in this guide. Horseback riding in Nevada is as popular as ever. Click here to find out why and to see which places will bring you the most joy! 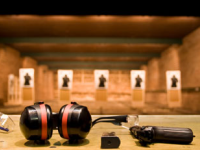 Take a day off from work and test your ability on a firearms. See if you have what it takes to have control over strong weapon. Don't just test your ability on control, test your ability on aim and precision.